In 1930, Mrs. Mildred A. Dorsey and Rev. William T. Holt, the rector of St. Paul’s Episcopal Church, began the organization of a free and public library to serve the people of Newport and Jackson County. A large room in the crypt of St. Paul’s Episcopal Church was offered to the sponsors to serve as the library, with utilities – heat, electricity and water – donated. Mrs. Conrad Bach, or Miss Jessie as she was known to all, was chosen as the first librarian. The library was started with a small number of volumes – including an out-dated encyclopedia, books of fiction (some published many years before), books that owners were eager to get out of their own bookshelves to make room for more popular volumes, and books salvaged from attics and store rooms-but without a single dictionary. During the first few months after the library was opened, Miss Jessie was pleased if an average of 20 books were withdrawn. The variety of books ranged from scholarly works to the lightest of fiction. Readers gradually began to seek the quiet, restful atmosphere of the library for an hour or two of reading. The happy and interested group of children who frequented the library after school hours and during vacation days gave plays, parties and other benefit affairs to increase the finances of the new institution. The institution grew as the community became library and book conscious. Eventually, the public realized the free library as a reality and there was every indication that it would become a permanent institution. Sponsors developed plans for the growth of the project, and when these plans became known, public interest began to increase. The Newport Public Library, Inc. was organized on June 1, 1933, to promote and manage the affairs of the Newport Public Library. The executive committee at this time consisted of Rev. W. T. Holt, president; C. M. Erwin, Jr., secretary-treasurer; and Dr. Charles E. Carroll, D. J. Etheridge, Mrs. M. A. Dorsey and W. T. Parish, Jr., directors. The real progress of the library began in April 1935, when it became a project of the Works Progress Administration under the sponsorship of the American Legion Auxiliary. In the next two years, the membership — free to everyone– increased from 200 to more than 2,000. Slowly the empty shelves were filled with modern and current fiction and nonfiction books, as well as a balanced assortment of reference works-histories, biographies, and works on philosophy, poetry, art, science, current events and religion. During 1938, a total of 18,027 books and 1,937 magazines were circulated by the Newport library and its branches. In 1939 Judge L. L. Mack offered quarters in the Jackson County courthouse for the Newport Public Library which had outgrown its housing at the church. By this time the library shelved more than 3,700 books and daily circulation had increased to more than 50. After the Library became a permanent institution in Newport, the librarians and directors began the organization of a countywide system of branch libraries. 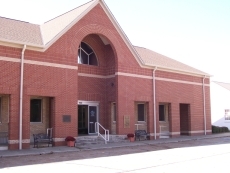 In a short time, a total of seven branch libraries had been established in various sections of Jackson County. The librarians for these various branches were furnished by the National Youth Administration (NYA) and proved to be very satisfactory and efficient. Books were classified and catalogued alphabetically by title and author even when the collection was quite small. The librarians were eager to help those who used the library’s resources. They attended institutes and schools of instruction for librarians conducted in Little Rock and other towns under the auspices of the Arkansas Library Commission. The NYA program was discontinued in Jackson County in December 1938, and several branch libraries were forced to close. The first Jackson County Library Board was formally established in 1942 and the Newport Public Library became the Jackson County Library, with election of these officers: Mrs. G. K. Stephens, chairman; Mrs. Lula Harvey, vice-chairman; Mrs. Alice Graham, secretary; and Dr. C. E. Carroll, treasurer. In 1947, a number of branch libraries were established, including a branch at East Newport and the McEwen Branch Library, named in memory of Theo McEwen. The libraries were located at area schools – the East Newport Branch at the East Newport School, the McEwen Branch Library, and Branch High School – but they were intended to serve both students and adults. The W. A. Billingsley home on Hazel Street was offered to the Jackson County Library in 1948, but at the same time, there developed an interest in providing the county with a new library building. The voters of Jackson County subsequently approved a one-mill tax for this purpose by the vote of 2,375 to 511. Mrs. W. A. Billingsley offered to provide most of the financing for a new building while the Jackson County Quorum Court approved a request to allow the library to use part of the jail yard for the new building. The Jackson County Library Board in 1949 included Mrs. Gertrude Kell, chairman; Mrs. G. K. Stephens, Mrs. L. L. Mack, Mrs. Lon Phillips, Mrs. Jim Denton, Mrs. Owen Burton, Mrs. H. R. Browning, Mrs. Willis Martin, Mrs. Emmett Mitchell and J. R. “Bill” Purdy. On August 23, 1949, ground was broken for the building. After a dedicatory address by City Attorney Kaneaster Hodges, who represented Mrs. Billingsley, the first spade of dirt was turned by Mrs. Jessie Bach, county librarian. Harry Wanger, a Little Rock architect, designed the new building and construction of the building was performed by Cone Construction Company of Searcy. The original trustees were H. 0. Walker, Mayor of Newport; J. G. Armstrong, Jackson County Judge; and Gaither C. Johnston, president of the First National Bank. The W. A. Billingsley Memorial Library was opened on Sunday, April 30, 1950. After a memorial statement on the life of W. A. Billingsley, delivered by Kaneaster Hodges, Mrs. Billingsley presented the keys to the new building to Mrs. Jessie Bach, county librarian. Mrs. Bach’s response was simple: “This is the greatest moment of my life; it is a dream come true.” Mrs. G. K. Stephens, vice-chairman of the Jackson County Library Board, accepted the library on behalf of the citizens of Jackson County. Mrs. P. H. VanDyke presented the library with a memorial gift to purchase books in memory of Mr. Billingsley. In January 1951, there were 14,263 books in the library. In December 1950, the circulation was 10,076. Books circulated through the branch libraries totaled 4,964. At that time branch libraries were operated at Beedeville, Grubbs, Swifton, and Tupelo. Books were also circulated in the schools at the Newport Airbase, Olyphant, Remmel, Grand Glaise, East Newport, Johnstown, Ingleside and Branch. On May 1, 1959, Mrs. Mary Jo Aslin became a member of the library staff and was director of the deposit stations which were located in stores or in homes of the following communities: Olyphant, Grubbs, Tucker’s Ridge, Beedeville, Swifton, Campbell Station, Amagon, Coffeyville and Oakland. She also helped with the library at the Blackville School. Due to ill health, she resigned in May 1967. A branch of the library was located at Tuckerman and was headed by Ed McDoniel in 1950. Martha Ann Howe succeeded Mrs. Bach as librarian, assuming her duties on July 1, 1965. Mrs. Howe said a love of books, which she has possessed for many years, was a major influence in her decision to enter the library profession. Mrs. Howe was an active member of the American Library Association and the Arkansas Library Association. Martha Ann, as she was known by all, served as librarian until her death November 25, 1972. During her tenure, the W. A. Billingsley Memorial Library was expanded. By 1966, the library had outgrown its quarters again, so an extension to the building was proposed. In March, the Arkansas Library Commission received notice that a federal grant for 60 percent of the cost of a $40,000 expansion of the W. A. Billingsley Memorial Library was approved. Edward F. Brueggman, a Little Rock architect, executed the plans for the reconstruction, and the application was made in September 1965. At the time the project began, the members of the Jackson County Library Board were Mrs. Willis Martin, president; Mrs. Lon Phillips, Mrs. Owen Burton, Mrs. Lawton McClard, Mrs. L. L. Mack and J. R. “Bill” Purdy. Members of the Newport City Library Board were: Claude Erwin, chairman; J. E. Doherty; Mrs. Paul Jamison, Mrs. Ralph Sink and Mrs. B. J. Best. Library trustees were Jack Owen, president of the First National Bank of Newport; Aden Williamson, Jackson County Judge; and Harry Minton, Mayor of Newport. Dixie Lumber Company of Newport was awarded the contract for expansion, and work began in June 1966. The expanded library was dedicated in an open house on Sunday, February 27, 1967. Senator Robert Harvey of Swifton delivered the dedicatory address to the 300 persons who attended and Mrs. Merlin Moore, chairman of the Arkansas Library Commission, made the response to the welcome. Library trustees at the time of the dedication were Jack Owen, President of the First National Bank; Jackson County Judge R. L. “Buzz” Harper, Jr.; and Lloyd Fulenwider, Mayor of Newport. Mrs. Ruby Herring became a member of the library staff on October 1, 1965 and was appointed librarian after Mrs. Howe’s death. She served in that capacity until November of 1984. Other members of her staff were Mrs. Mary Frances May, Mrs. Helen Darling, and Mrs. Mary Louise Magnum. Ila Lacy was appointed librarian succeeding Mrs. Ruby Herring. She has served in that capacity until her retirement in 2008. The end of the 1980s saw the need for yet another expansion. This extensive remodeling saw the building expand upward as well as outward on all four walls. Public funds and private donations, one of which came from Sam Walton, founder of Wal-Mart Enterprises, in the amount of $250,000. A second dream come true was celebrated with a Dedication Ceremony, held October 21, 1990 to commemorate this latest expansion and remodeling. A special room in the library has been named for the Waltons. The Waltons’ Special Collection Room, which is on the second floor of the library, includes reference and history books, Arkansas books and genealogy materials. The room houses microfilm of all the local newspapers, U.S. Census Records for all the counties in Arkansas, cemetery records for all inventoried cemeteries of the county, and histories of many early settlers of the county. Staff members Sally Dunkin and Ellen Crain are instrumental in keeping the library functioning smoothly.